Great build quality and design, but expensive and no dedicated media keys. 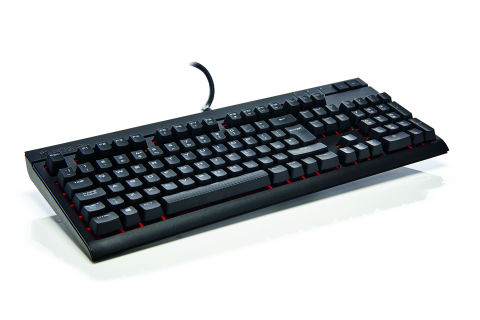 Great build quality; good-looking design; LED controller; authentic Cherry switches; USB passthrough. Lack of dedicated media keys; still $110; lack of aluminum chassis; no wrist rest; difficult key caps. Mechanical keyboards. Love them or hate them, they’re here to stay. Whether you’re still not convinced it’s worth dropping the extra $60 or $70 on a mechanical key switch or not, it might be worth giving this review a read. Corsair brings to the overcrowded table a slimline version of its popular Vengeance series of boards. It’s a brand synonymous with solid build quality and premium feature sets, and the Strafe doesn’t disappoint. Packing Cherry MX Red key switches, it’s quiet, but still has that mechanical sound and feel associated with Cherry’s carefully crafted clackers. If this is your first time delving into the world of Cherry switches, you’ll find the Red switch is very soft to the touch. It has an incredibly sensitive actuation point, meaning that placing just a small amount of pressure down on the key will activate the switch, without any tactile feedback to let you know that you’ve activated the key. Sounds bad? Well, not entirely. Once you adjust to the new switch style, you’ll find it’s actually very responsive, meaning it’s much easier to react to otherwise more difficult situations. It’s ideal for gaming. The overall build quality of the Strafe is impressive. Although it has a plastic outer shell, the keyboard itself has very little flex. This is primarily down to Corsair including an aluminum support bar through the middle of the board, not that you’ll ever see it. And while it lacks the classy metal chassis of its older K70 Vengeance brothers, the Strafe is still a good-looking keyboard with a beautiful set of outlying LED stripes to complement the overall gaming feel. It also features the LED controller found in Corsair’s latest RGB series of peripherals. That means you can have any number of complex LED wave patterns and responses to boot. It sounds like a gimmick, but trust us, you can spend hours just staring at your keyboard as it reciprocates like a Cylon or ripples from your touch. Other features include media control via the function keys, brightness control and a Windows lock key. The board also comes with a USB passthrough, which is handy. Depending on whether or not you’re playing MOBAs, you can even change out the key caps and the more traditional WASD keys. The only downside to this board is the lack of truly dedicated media keys. It would have been nice to see a dedicated volume wheel and other keys in the top right. However, for the price point, it’s understandable why Corsair couldn’t include them. Other than that, a wrist rest would have been a bonus, too, as it can sit a little high on your desk. Again, this does take some time to get used to. Granted, there are a few alternative mechanical keyboards out there for this price, but none of them feature the same integrated LED controller or the modern level of gaming aesthetic design as seen on the Strafe. That said, you can pick up a K70 Vengeance in red now for the same price—despite its slightly dated design, the dedicated media keys and all-aluminum body make it incredibly tempting (not to mention the lack of garish sails). Should you buy this? Well, if you like pretty lights and want a solid, dependable, and versatile gaming keyboard, then yes, the Strafe is certainly worth considering. It could be your weapon of choice.